Found no more than once a decade, Playg will appear seemingly out of thin air. Peculiarly , no wild populations are known. 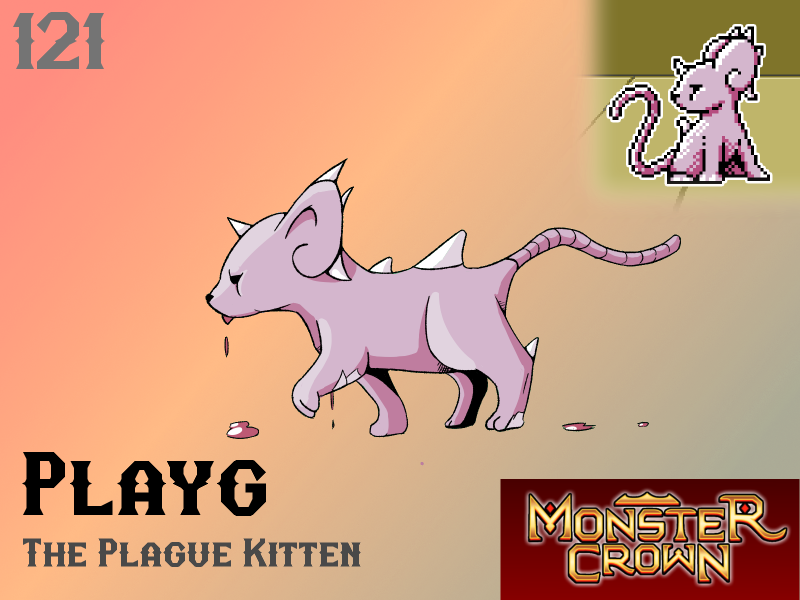 Playg are calm monsters that will approach humans gently as if already tame. This monster's temperament is calm - they will simply lick their fur and let out sweet mews even as chaos breaks out around them. Finding a Playg in your home is an instant tragedy. If the discoverer is to have any hope of surviving they must burn their house to the ground at once, leaving all possessions to the blazes. Unfortunately Playg's appearance makes it incredibly appealing to young children, who often seek to pet Playg and make it their own. Will Playg make your team?